Previously released tracks include “Lost to Love“, “Do You Love Me?“, “After All This Time“, “Dancing on the Shore” (featuring Kirk Whalum on sax) , “Song for Elizabeth” (featuring Dave Grusin on piano), and “What Does It Take (To Win Your Love for Me)” (featuring Candy Dulfer on sax). This album is definitely a welcome addition to your collection. This entry was posted on Thursday, May 29th, 2003 at 6:35 pm. 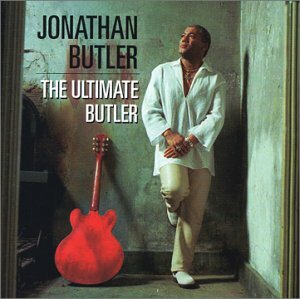 It is filed under Music Reviews and tagged with guitar, jazz, Jonathan Butler, The Ulimate Butler. You can follow any responses to this entry through the RSS 2.0 feed. I had the opportunity to attend the Atlanta Jazz Festival on Memorial Day. After enduring a 2 hour drive, I was able to enjoy the sounds of Metalwood(www.metalwood.com) and Maysa. I was surprised. She sang very well, but some of her songs sounded alike. I guess I was trying to hear her “Incognito” sound too hard. Nevertheless, she gave a rousing performance. Oakland and Yoshi’s really need to think about putting on a major/major/major/major jazz festival. I love Monterey, but we don’t need to keep driving that far down when we have talent in the backyard. Sooooo, when are you going to open up Yoshi’s competition? Feh, another item I need to purchase. One of my favorites is “lies”. But as usual, you make this sound so wonderful, its a must purchase. I just found out Jonathan will be here later this month for an outdoor jazz concert. I was on a mission earlier this year to get all of his stuff on CD. Mission Accomplished!!! Between ebay and half.com I was able to do it. I’m still trying to get all of Michael Franks and also all of Maze. I had the honour and privilege of seing Jonathan Butler live here in his home city of Cape Town, South Africa. He was ABSOLUTELY STUNNING! !